On Jan. 13, after more than two years of hard work by many MnDOT employees, the Enhancing Financial Effectiveness Asset Management Battle officially wrapped up its project and operationalized the team’s work. Over the life of the project, the team set up new structures and systems to determine life cycle costs for MnDOT’s major assets on an ongoing basis. 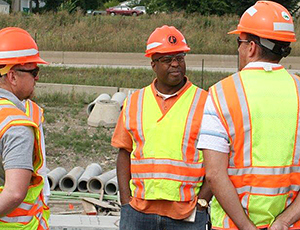 Additionally, the team trained hundreds of Operations and Maintenance staff to complete more detailed time reporting to enhance MnDOT’s asset management data collection. This allows MnDOT to produce more thorough reports to improve decisions on how and where to make investments. Dave Solsrud, Asset Management Project manager, reported at the final EFE Quarterly Report Out on Jan. 28. A WIG Asset Team was established for each of four major asset types: bridge, pavement, culverts and overhead sign structures, and tower lights. The team was charged with determining information needs, developing processes, technologies, training and culture change necessary to implement resource tracking to achieve the project goals. New resource demand models were created for each of the four asset types. Resource demand models are basically formulas used to forecast MnDOT's labor, equipment and materials needs in the future. They are directly related to predicted infrastructure condition, and show that if capital investments don’t keep up, for example, more demands will fall into maintenance areas. The Asset Management battle’s work will be operationalized by the newly formed Asset Management Team. A recognition and planning event is planned for early March for team members to celebrate their accomplishments. Tracy Hatch, deputy commissioner, chief financial officer and chief operating officer, complimented the commitment and hard work of all employees involved with the EFE WIG effort. Lessons learned are a big take-away from Enhancing Financial Effectiveness, WIG 1.0. One of these lessons is that all areas need someone closer to their office/district/team to help them successfully use the 4 Disciplines of Execution process and to be available to coach them when issues arise and when report-out time nears. Seventy-five of the 78 coaches from all across MnDOT have been designated, and participated in a kickoff event Feb. 16 in St. Paul. 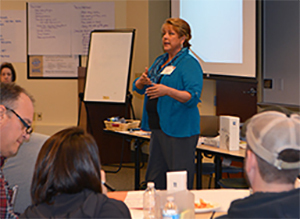 AnneMarie Burgess, state program manager for WIG/EFE, led the coaches through their roles, provided an overview of the 2.0 development and launch timelines, and provided them with an understanding of group dynamics and resources available to them. Take a quick look at a wind speed map and it’s easy to see that southwest Minnesota has the highest average wind speeds in the state. That’s good news for the companies who erect wind turbines, but bad news for MnDOT snowplow operators who often drive in low-visibility conditions to clear roads. That’s why District 7 is piloting a snowplow driver assist system to combat the blowing snow and fog that often cause zero visibility. The DAS helps snowplow operators see road alignments and features, such as turn lanes, guardrails and road markings. Even in less extreme winter weather, snowplow operators gain assurance of their lane location using the system. 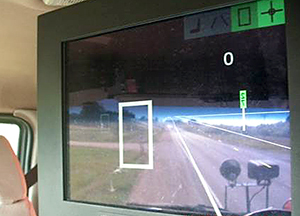 The system is used on the same computer in the plow that contains the Automated Vehicle Location system, which uses GPS and cellular communications to track locations of trucks. Using the same computer also reduces hardware costs and space usage in the cab. The AVL system is used in more than 600 MnDOT snowplows throughout the districts. The DAS is also tied into the Continuously Operating Reference Stations, a network that collects and continuously updates real-time data from the Global Navigation Satellite System. The CORS network is used by surveyors, engineers, landscapers, utility locators and others to pinpoint geographic locations. (See related Newsline story about CORS). The DAS is currently installed in one truck in District 7. The $75,000 cost makes it difficult to install in every truck in the district or state, although having at least one system in every district may be possible. Fester said the system proved its worth last week when blizzard conditions caused zero visibility and forced many road closures in southwest Minnesota. He was called out at 2 a.m. Feb. 8 to assist a stranded state trooper and several motorists on a 12-mile stretch of Hwy 60 between Windom and Heron Lake. Fester drove a pickup behind the DAS-equipped snowplow, driven by Darryl Oeltjenbruns, to reach them. As the DAS identified stranded vehicles on the way to Heron Lake, Fester and Oeltjenbruns checked to make sure they weren’t occupied with people. Once they made it to Heron Lake, they stopped at the community center, where the state ptrooper and the stranded motorists he brought in were. 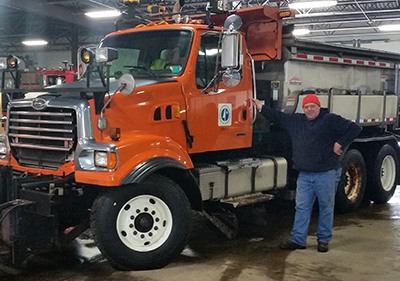 Once snow flies on Minnesota roadways, MnDOT snowplow drivers get to work to clear the road and keep traffic moving. But determining when it’s OK to take plows off a road following a storm can be tricky. Right now, maintenance crews rely on visual inspections to estimate when roads will be clear of ice and snow – a measurement commonly referred to as “time to bare pavement.” But results from a recent MnDOT-sponsored research project suggest that analyzing traffic data may be a more accurate and less costly way to gauge the progress of maintenance operations. Researchers developed an alternative process that uses existing traffic detectors on freeways to determine when traffic flow patterns have returned to normal, and successfully tested the software system on two Twin Cities routes. University of Minnesota Duluth civil engineering professor Eil Kwon is leading the project that he believes can take the guesswork out of assessing traffic conditions during winter weather events. In the first phase of the research project, researchers developed a prototype process that uses data on traffic speed, flow and density collected by loop detectors in the Twin Cities metro area to estimate the point at which traffic patterns return to normal — an indicator that the roadway surface has “recovered.” In a newly published second study, researchers further analyzed the traffic flow patterns during snow events under normal and snow conditions, and refined the earlier prototype into a traffic data-based measurement process for snow operations. “We found that by comparing the variation patterns in traffic flow during a snow event with those during normal weather conditions, we could successfully identify the recovery status of the traffic flow at a given location,” Kwon said. The researchers developed an alternative measure of performance, called the Normal Condition Regain Time, to the traditional “time to bare pavement” measurement used to gauge the progress of maintenance operations during a winter weather event. One advantage of the new process is it can reflect how road surface conditions affect traffic flow differently during day and night periods. 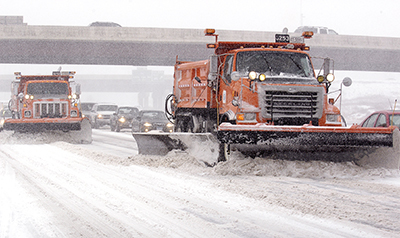 The Metro District currently is leading a third phase of research to develop an operational version of the system, which will analyze and improve winter maintenance operations on a daily basis across the Twin Cities freeway network. In the future, MnDOT may investigate the possibility of expanding the system statewide. Check out the project website for more information. This article was adapted from an online story on MnDOT Research Services’ blog, Crossroads. The Office of Chief Counsel announced its newly redesigned iHUB website, which went live Feb. 3. 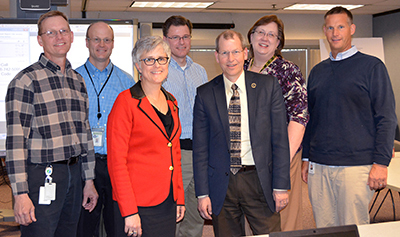 The expanded site allows the office to better connect with MnDOT customers and more effectively share legal, policy and records management tools with MnDOT staff. In addition, the site provides quick ways to contact staff, helpful links to legal resources, and a form you can use to request legal, policy and records services. You may have noticed minor updates to the way that news, projects and public involvement content is presented on District 6’s and District 7’s web pages. The goals were to sort information by area, to reduce confusion with more streamlined navigation, and to better focus on the content recommended most by viewers. If you have questions, email webteam.dot@state.mn.us. New Library Materials are available at www.mndot.gov/library/newlibmat.html. This issue includes a call for feedback to help inform MnDOT Library’s strategic plan. New Library Materials is a compilation of new titles and other resources added to the library collection during the previous month. To be added to the distribution list, contact pamela.m.gonzalez@state.mn.us or 651-366-3749. Previous editions of New Library Materials are archived and available at www.dot.state.mn.us/library/recacq-archive.html. For other information requests, contact the Library at 651-366-3791 or e-mail library.dot@state.mn.us, or send requests via the Ask a Librarian web page. To request IT services, use the IT Self Service icon on your desktop. The newly upgraded IT Self Service Portal is accessed through the IT Self Service Icon on your desktop. This will be the most efficient method when requesting IT Services. Here is a link to an overview of the new IT Self Service Portal. Note: The IT Self Service Portal will be unavailable from Friday, Feb. 26, at 4:30 p.m. to Monday, Feb. 29, at 7 a.m. The IT Service Desk is operated from 7 a.m. to 5 p.m. To contact the service desk, go to the Self Service Portal at http://remedy/selfservice.htm, send an email to ITServiceDesk.dot@state.mn.us, or call 651-355-0200. How fast does 25 years go by? Ask Ashanti Payne, who is approaching a quarter of a century in MnDOT’s Office of Civil Rights. Payne rarely has a dull moment as the OCR is a beehive of activity. His duties of attending Disadvantage Business Enterprise outreach meetings, providing oversight for business development programs, and administering federal programs all contribute to Payne’s workload. However, he is visibly passionate about his work and supplies energy and understanding for the daily challenges inherent in the position. “Ashanti has been with the department for 25 years in 2016 and brings an excellent background to the position. We are delighted to have someone of his experience in this important role,” said Kim Collins, Office of Civil Rights director. Prior to his position as manager of supportive services for workforce and small business, Payne served as the small business contracting supervisor. He also was workforce contract compliance supervisor, where he provided strategic direction for clients and staff, and served as the office’s Title VI (of the Civil Rights Act of 1964) representative. Payne also worked at various other positions within the Office of Civil Rights. Payne studied at Pomona College in Claremont, Calif., where he received undergraduate degrees in philosophy, political science and economics. More recently he earned undergrad and master's certificates as a certified compliance administrator from the American Contract Compliance Association through the University of Minnesota and Morgan State University in Maryland. Payne’s strong strategic vision for the agency’s DBE program guides the office during a tempestuous timeframe, not just for Minnesota, but for transportation departments nationally. I see my role as helping provide tools, resources and initiatives and helping develop programs to enhance the department’s ability to meet the needs of the external civil rights program. What specific tasks do you do as manager of supportive services for workforce and small business programs? I identify grant writing opportunities, oversee contracts and processes and approve funding requests. As a team, we develop what we are going to do and what are the measurables. We identify funding and special allocations from the Federal Highway Administration to develop programs and initiatives and help small businesses compete for contracts. Who is on your business and program development team? We have an excellent team that plays a vital role in successfully carrying out our programs. What do you consider the team’s biggest success to date? As part of the Enhancing Financial Effectives effort, the team developed the Statement of Work that was submitted to the Federal Highway Administration to request funding for our programs. That, along with the comprehensive Small Business development and on-the-job training supportive services programs, enabled the department's initiatives to be organized into seven financial department IDs. This simplifies program funding for the OCR. How did engaging in the EFE effort help your office to function more effectively? Planning – As a team it allows us to make better funding decisions for initiatives. The initiatives may change annually but we are now planning several fiscal years in advance and making more informed decisions about funding. The bottom line is that as a department we are more nimble and can quickly launch a new idea into action. Spending – Organizing and understanding overall plans makes it easier to track and monitor the funds that are spent on these programs. Communication – This collective understanding of DBE initiatives and activities helps the department to talk about the program in a clear and consistent voice to legislators, the community and industry stakeholders. We can also quickly create program reports and identify funds that were allocated and spent. What is the budget for the program? Last fiscal year the department received approximately $2.2 million for all supportive services activities. What’s next for the Office of Civil Rights? Our vision for what’s next for MnDOT OCR is that we are sought out by other DOTs across the nation as a leader in the administration of Civil Rights programs, and a source for best practices on how to connect minority, women workers and small business owners with opportunities. Payne’s office is located on the 7th floor of CO. He can be reached at ashanti.payne@state.mn.us and 651-366-3071. Do you or a co-worker have an interesting job to share with readers? Send us your ideas, and we’ll contact you for more information.